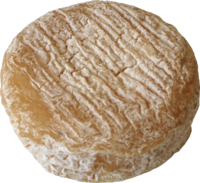 This is a list of notable goat milk cheeses. Goat cheese is produced using goat's milk, the milk of domestic goats. The milk is commonly used to make cultured dairy products, such as cheese. Myriad goat milk cheeses are produced around the world. Añejo cheese – a firm, aged Mexican cheese traditionally made from skimmed goat's milk, but most often available made from skimmed cow's milk. 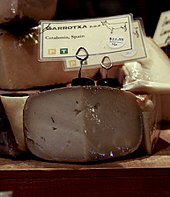 Majorero – from Spain, it is similar to Manchego, and is protected under European Law with Protected Designation of Origin (PDO) status. ^ Park, Young W. (May 1, 2001). "Proteolysis and Lipolysis of Goat Milk Cheese". Journal of Dairy Science. 84: E84–E92. doi:10.3168/jds.S0022-0302(01)70202-0. ISSN 0022-0302. PMID 11210053. Retrieved December 9, 2017. ^ a b c d Nosowitz, Dan (June 14, 2017). "What's the Difference Between Cow Cheese and Goat Cheese?". Modern Farmer. Retrieved December 9, 2017. ^ Oulton, Randal W. (January 8, 2004). 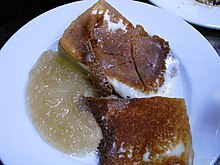 "Añejo Cheese". CooksInfo. Retrieved December 9, 2017. ^ Dilling, E.; Ball, N. (2015). My Paris Market Cookbook: A Culinary Tour of French Flavors and Seasonal Recipes. Skyhorse Publishing. p. pt278. ISBN 978-1-63450-864-3. Retrieved December 9, 2017. ^ Foard, Maggie (1 July 2008). Goat Cheese. Gibbs Smith. p. 56. ISBN 978-1-4236-0368-9. ^ "European Commission PDO database". Retrieved 21 March 2013. Goat's milk cheeses. Cook's info. This page was last edited on 28 January 2018, at 22:04 (UTC).